Applications, marketing programs, and bots need proxies for them to work. Proxies are used when unblocking websites and using SEO tools. There are many free proxies provided online, but very few of them guarantee safety and privacy of your online data. A proxy server acts as an intermediary between the user and the server to be visited. A request is sent from your PC to the specified direction using a proxy server. It allows the user to browse using other IP addresses. A proxy connects to the website instead of you thus concealing your details. Private proxies speed up your work, especially when using some applications. The reasons why people use proxies is to enjoy anonymous browsing, unblock censorship and change their IP address. A dedicated proxy is simply a dedicated IP used by one client at a time. This helps in hiding public IP address assigned by the ISP. This private server is accessible to one individual. It is much faster since it eliminates overcrowding due to many users. A personal service provides a faster browsing speed. It is the perfect choice for anyone considering to start a business online. Dedicated or private proxies allow you to protect your online information. They can be utilized for any service online to increase your operations. Activities include search engine optimization, web scrapping, among others. Proxies are used to look for backlinks and track ranks. Many programmers use proxies to scrape social media profiles. Dedicated proxies are used as social media proxies to connect online platforms thus increasing market reach. The most used ones are HTTP proxies which are used to connect social media accounts which are highly restrictive in nature. It makes it possible to manage multiple social media accounts from one place. They are also used to cope shoes using sneaker bot. Specially dedicated proxies for foot sites are used to overcome many IP addresses from the same IP address. This helps you in scaling up your operation or perform many tasks on the sneaker bot. Dedicated servers can be localized so as to avail online services in that area. Private proxies are used to Geo-spoof search engines and perform specific web scrapping. Most restrictive web sites can be reached using private proxies. They include ticketing websites which allow users to buy only a few tickets per IP. There are many dedicated proxies available online which make the selection process quite overwhelming. B on the look out for proxy providers who market shared proxies as dedicated proxies. Some even provide free public proxies and dedicated proxies. Choosing the wrong proxy puts your privacy and data safety in jeopardy. Some proxy provides sell revolving lists while other provide customers with proxies and proceed to change them later when requested. For most people price is the main deciding factor. But don’t let the price compromise on speed, safety, and anonymity. Private proxies allow you to pay for quality, not quantity compared to shared proxies. Microleaves is one of the largest proxy networks. They provide dedicated proxies with 99.9 percent uptime 24/7 customer support and three days money back guarantee. They have thousands of IPs ready for use. Your order will be processed automatically. 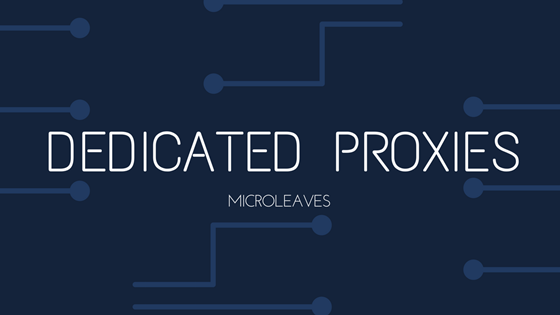 Microleaves dedicated proxies are located in the US which makes them perfect for your business. A hosting plan based on a dedicated proxy provides high-speed connection. Dedicated proxies are much safer thus allowing you to bypass filters and firewalls. Private proxies provide you with more IP addresses and a wide selection of geographic locations. They help in concealing you browse history thus providing confidence while surfing. Regarding the server, dedicated proxies create a cache which prevents similar information transfers among servers. It accelerates loading time and improves the accessibility of previously visited websites.They enable you to become highly anonymous by hiding your real IP address as well your geographic location.Internet serves are even not aware if you are using a proxy. Using HTTPS protocol for your websites offers more protection. Again, dedicated proxies support both HTTPS and HTTP protocols. Most browsers and server administrators collect information about web visitors. E-mails that are not encrypted can be read by e-mail server administrators. Web browsing is also closely tracked for making advertisements. Private proxies make it hard to tell where you have visited and the duration. They keep your browsing sessions private and secure.It prevents hacking by cutting off the access to information like phone numbers, addresses, and financial information. Hackers usually sell this information to other companies and hackers. For a business website, you may en up with junk emails and endless sales calls. Hackers can open accounts in your name and even access your financial accounts. The anonymity provided by private proxies avoids all these scenarios. It prevents hackers from getting into your computer to access your information using techniques like installing a keylogger to record what you type. Dedicated proxies protect you from any type of hacking. The main disadvantage of private proxies is that they are more expensive compared to share Dedicated Proyd proxies. Some servers don’t guarantee full anonymity. It is also hard to provide full confidentiality. Sometimes these companies allow access to user information upon request of law. Attaching a chain of proxy servers between different geographic location reduces possibilities of data disclosure, but not everyone can afford it. Dedicated proxies are very ideal for professional use when performing tasks online. They allow you to cross boundaries, choose any geographic location and attain the right browsing speed. They are meant for individual use thus preventing overcrowding. These proxies provide safety from hackers and administrators who collect information. Private proxies are less susceptible to disconnections. There are many dedicated proxies out there, but few of them are genuine. Getting a genuine proxy goes a long way in determining the success of your online business. Private services show more strengths than weaknesses compared to free or shared proxies. People who are looking for exclusive usage need to have the right budget to enjoy private proxies.